Lovely course where every hole provides a different challenge. Unusual 10th hole (par 5), which can be reached in one if one aims 90 degree right of the fairway and 240 yards over the lake. 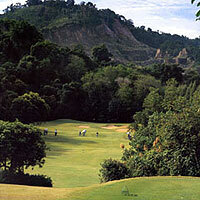 This is a fun/user friendly resort golf course set in a valley with the golf course meandering through hills and limestone cliffs and traversing 3 distinct environments (6 holes in undulating hills, 6 holes on the level and 6 holes through landscape forest). Not intimidating or humiliating - wayward shots are not severely punished.